Paws Awhile: We Are Ready....The Rig Is Ready....But Now We're Waiting For The Truck! We Are Ready....The Rig Is Ready....But Now We're Waiting For The Truck! Last week the truck refused to start! It had always been slow to turn over and ignite into life, but finally, it refused to start at all! When we bought the truck through 'Star Trucks" in Richmond at the end of May 2015, the condition of the purchase was that the starting would be fixed. Star Trucks is owned by Dale, and Dale took the truck to Heslops to repair the starting. Heslops had the truck for a couple of months and the starting didn't improve! Eventually, four months later, in September, Bernie had to take the truck to Tauranga, so the hitch could be fitted on it. Even after all that time, the truck remained slow to turn over and start! 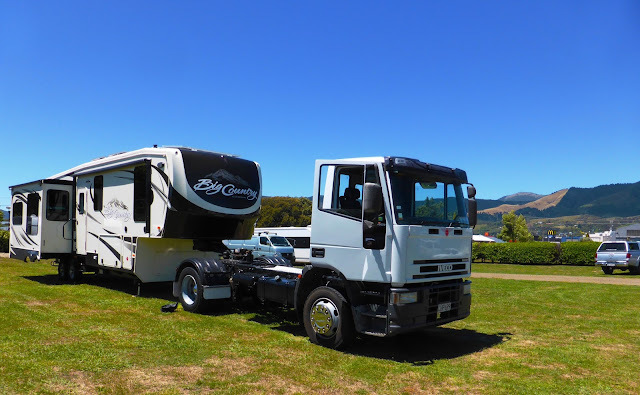 At the end of December, when Bernie drove the rig back from Tauranga, the truck was still slow to start....plus...when towing the rig up hills, the truck's temperature rose into the max zone. Fortunately, we got the truck and the rig back to Nelson. The following day, the truck absolutely & completely refused to start. It turned over, and over and over...but nothing! SO FRUSTRATING! The next day (Monday), Dale (from 'Star Trucks') organised someone from Heslops to collect the truck. We were told they'd remove the pump and send it to Auckland to get repaired. After a week, on Friday, Bernie rang Heslops to ask how everything was going...he was told that they had been busy and hadn't removed the pump to send it to Aukland! To say we were majorly disappointed is an understatement! The holidays are now quickly drawing to a close and our plans/dreams of having time in the rig haven't happened. It is really disappointing and soooo frustrating. We've told 'Heslops' that we need the truck ready for this Friday. We've already made plans to meet Amanda & Paul Walters at McKee Domain in Ruby Bay. They've said 'Rob' who also owns a Big Country will be there, plus a couple who own an 'Ultima". So we're really keen to be there as well, to meet the others, and learn how they've set themselves up for life on the road.